Nova Southeastern University’s (NSU) shark researchers are at it again! · Scott Shark (for Governor Rick Scott). Dr. Dodge is the dean of NSU’s Halmos College of Natural Sciences and Oceanography, which is home to NSU’s GHRI. He stressed our sharks are non-partisan. Following in their fellow makos’ “fin-steps” from 2016, these sharks are the latest animal prognosticators to weigh in on an issue of state and national importance. They join the ranks of Punxsutawney Phil, the famous groundhog who lets us know annually how much longer winter will last and Paul the Octopus, the soccer savant who, in 2010, predicted the winner of the World Cup. The race rules are very simple: each shark has a satellite tag affixed to its dorsal fin (akin to a human getting an earring.) These tags “ping” to a satellite each time the fins break the surface of the ocean, which allows researchers to follow the mako sharks as they do what sharks do best – swim around in the Atlantic Ocean. The race is scheduled to run from Fri., Oct. 16 – 3 p.m. Sat., Nov. 3. Researchers will then determine which shark in each race logged the most miles, with those sharks being named the “winners” and, thus, predict who will be taking up residence in the Florida Governor’s mansion and who will make their way to the U.S. Senate. In all seriousness, Dr. Dodge points to the fact that researchers in NSU’s GHRI have been tagging and studying various shark species for many years, with the goal to gather as much data as possible for decision-makers to use in helping protect these apex predators for generations to come. In addition, NSU’s Save Our Seas Shark Research Center and GHRI scientists are conducting advanced DNA genome research on sharks to understand their remarkable immune systems, including their rapid wound healing and apparent higher resistance to some cancers. While this shark-tracking campaign sounds relatively easy, it’s not. There are a few variables that may come into play. First, there’s no way to guarantee that the tagged sharks will log a significant number of miles. While they were caught, tagged and released in the same general vicinity, sharks, like humans, tend to follow their own path. There’s the possibility we tagged a shark that likes to venture out into the middle of the Atlantic Ocean, while another may prefer to frequent a smaller, more familiar area. Something else that can impact this project – the sharks do not have any special protection just because they’ve been tagged by NSU researchers. 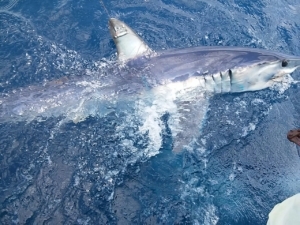 Like their “fellow” mako sharks, they are on their own swimming in the Atlantic Ocean and are subject to the perils their natural habitat may bring. And if that wasn’t enough to worry about, Shivji said there’s also the possibility a satellite tag will simply stop working, and we lose contact with one or more of the sharks. Hopefully none of these things will happen, and the four tagged sharks will make it to the end of the mid-term races and beyond, continuing to provide NSU scientists vital data for their research. While this is a fun, light-hearted way of looking at the election cycle, the research behind this project is pretty serious. Dr. Shivji indicated that worldwide, sharks are being killed off in unimaginable numbers – some estimates say up to 100 million sharks per year. Clearly, that is not a sustainable level of removal, since many shark species, including makos, reproduce at low rates. That’s why the work being done at NSU is vital – we must learn as much as we can about these majestic creatures so we can take steps to ensure they don’t vanish from the Earth. Research has been, and will always be, something that gives NSU an edge and is a vital part of a world-class education. So as the 2018 election cycle draws to a close, make the best shark, um, candidate win!